Update: The article has been updated with steps for inserting the SIM in iPhone 7, iPhone 7 Plus, iPhone 6, iPhone 6 Plus, iPhone 5, and iPhone 5S. 1. Take a simple paper clip and make it straight. You can also use the SIM eject tool if it’s included in the phone package. 3. Insert the pin into the small hole and push it slightly firmly until the tray pops-out. Now pull out the Sim card tray with your hands. 4. Place your Micro SIM card into the SIM tray. Make sure it fits perfectly and the golden circuit side of SIM is faced downwards. 5. Push the tray back into slot in the same manner you ejected it out. You’ll hear a click upon successfully placing the tray in its place. 6. Wait for iPhone to recognize the SIM card. That’s it! 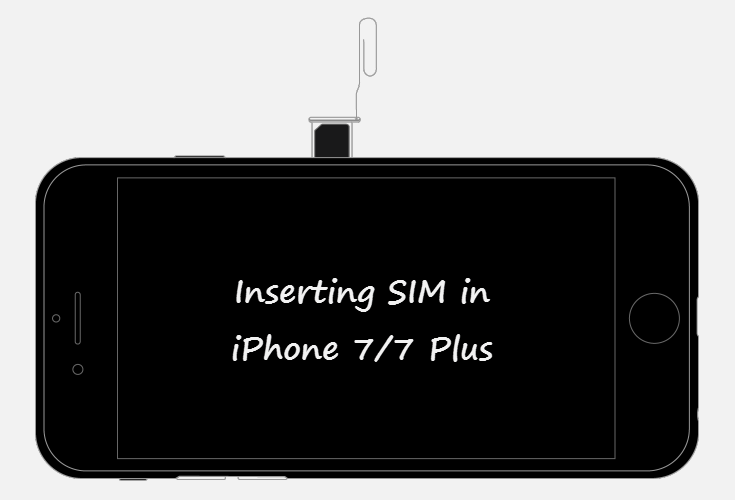 Update: SIM insertion method is exactly same for iPhone 4 and iPhone 4S. Apple has announced the next-generation iPhone ‘iPhone 5‘ which is just 7.6mm thick, the world’s thinnest smartphone according to Apple. To make this happen, Apple has switched to a nano-SIM card in new iPhone 5, which is 44% smaller than a micro-SIM. Certainly, you wont be able to use your normal SIM or Micro SIM card in iPhone 5. And nano-SIM being a new standard introduced by Apple, wont be available anytime soon with all the carriers. As stated by ETSI, The fourth form factor (4FF) card aka Nano SIM will be 40% smaller than the current smallest Micro SIM card design, at 12.3mm wide by 8.8mm high, and 0.67mm thick. It can be packaged and distributed in a way that is backwards compatible with existing SIM card designs. The new design will offer the same functionality as all current SIM cards. Comparing the dimensions, there is a substantial difference in the sizes of Micro SIM and nano SIM. Even if you manage to cautiously chop down your current SIM card using a knife or a pair of scissors, then it still wont work because the nano SIM’s thickness is reportedly reduced by 15%. Here is a video tutorial that describes ‘How to convert a Micro SIM into a Nano SIM‘ but it’s not a foolproof way and there are high chances that you might spoil your SIM while doing it. Also, the converted SIM hasn’t been tested yet in iPhone 5. The nano-SIM tray on iPhone 5 is placed similarly, on the right side of the phone. Simply use the SIM eject tool or a paper clip to remove it and place your SIM card. Apple has launched the iPhone 6 that supports Nano SIM card, just like the iPhone 5 and iPhone 5S. The Nano SIM card slot on iPhone 6 and iPhone 6 Plus is located on the right side of the phone. The Power button is now placed on the right-hand side to make it easier to access, as the new iPhones are significantly bigger in size with screen-sizes of 4.7″ and 5.5″. The SIM insertion procedure in iPhone 6 is same as seen in earlier models. Users simply need to use the SIM eject tool or a paper clip to pull out the SIM tray and place their SIM card. You might need to apply some force until the tray pops-out. Similar to iPhone 5 and iPhone 6, the new iPhone 7 & 7 Plus supports Nano SIM card. The SIM slot is located on right hand side just below the power button. To open the SIM tray, simply insert a paper clip or a SIM-ejector tool into the hole and pop it out. Now place the nano SIM with its gold side facing downwards and insert back the tray in the same orientation as you removed it. That’s it! Super! That was really handy! Thanks! i tried the paper clip, didnt work!!! now what? where from we get micro sim card in india????????? My local phone shop cut all but the gold pins (basically in half) for free & it works fine. Why do I get a normal simcard with my phone?! Damn phone shop! Thanks for stopping me before I wrecked my new phone! Very good instructions which I just used. Thanks! Let me know is it possible to put ordinary sim( Indian make) card in I phone-4? Brilliant, thanks for that but why dont they show how to in any of the instructions it came with ?!!? I got the chip in, and the phone still isn’t doing anything. What? They should include the right pin in the box. A paperless solution for the world eh? Why this hell do you need a paper-clip then? The ones that are used for securing more than one piece of PAPER together…the ones that are not digital technology, but common household office supplies. And why does it matter what size paper clip…Steve Jobs needs to get a job. This phone is great, but the fact that the SIM card requires a “SIM ejecting tool” is just awe-inspiring idiocy. We are very worthy of our trust in you and seek for a better future of this and you all comments. I got a micro sim from Airtel and just ready to use in my iphone4, contact Airtel Relationship Center (ARC) in your city ..
i have just spent 3 HOURS trying to get the sim card draw open on my new iphone 4 , i have read on line that this thing is a problem never thinking it would be this bad , this is a REAL PROBLEM and SHOULD BE FIXED, im shure APPLE know by now this simcard draw is somthing they shoud fix !!!!!! So if u were to use a normal sized sim card not the micro one, would it still work? I mean you’d have to chop it down 2 fit..
i dont have the small sim card, does i follow with the iphone package ? i think thats af problem ? shold i go to the phone shop and tell them i dont got the sim card ? cause i thought that i could use my own normal sim..
I’ve surfed the net more than three hours today, however, I haven’t found such useful information like yours. Thanks a lot, it’s really useful for me. i am wondering any hacks for free gprs can be used ? I think only micro sim can be inserted in iphone 4….. Thanks, that’s really helpful.. I have to contact my telco to get a new micro sim card then. Too bad the telcos here require a data plan with the iphone. Anyway, thanks for the info. Is there any difference between Normal Sim card and micro sim card. i need to install std sim in my iphone 4, but after cutting the sim can i use the same sim in my other phone ??? What? A paperclip? Retarded. I don’t happen to have a paperclip hanging around. This hi-tech communication device requires a friggin PAPERCLIP? How do I insert my normal simcard into an Iphone 4 phone? Mine virgin sim card has refused to enter. is that small size sim available in SAUDIA ARABIA,MAKKAH ??? It’s hectic cos my normal sim with all my info is too big. Can I cut it and how. Now, I’m a bit confused. That Micro-SIM card in the IPhone 4. Can you save data to it from the IPhone4? Can you also upload data from it, to the IPhone 4? For all the people saying the paperclip doesnt work, I just had the same problem. you basically have to push it in so hard it feels like youre going to break something but it will pop out. its supid i didnt have a key inside my box with my new 4s. crappy. and apple is getting on my last nerve with all this. FYI a pin for doing this is included in the iphone 4 packaging, it’s under the parcel with your ‘manual’ and essential apple stickers. Didn’t work. These instructions are not sufficient. I had to make too many adjustments for it NOT TO WORK. but thanks anyway. Thank you very much for giving me chance for watching Sim insert video.It is very much helpful for everyone. My 3 sim card isn’t working, can anybody help me…..???? I have an already established sim card – standard size. I have just purchased an iPhone 4 and have discovered that I need a micro sim, how do I transfer my number from the standard sim card over to the micro sim card??? Thnx for helping me do this, we scanned the instructions for ages then we went on the internet and found your website, I read the comments and saw that it was a good site. Thanks again for helping us. Thanks for your help,was struggling somewhat!!!!! please let me know whether the micro sim is available in idea store or not please reply me asp. That was exactly what I needed to know. Thanks heaps. Hi, just wanted to say thanks for these posts they were really helpful. I have just spent about an hour trying to work out where to put my micro sim and was getting soooo frustrated. I tried 2 different paperclips neither of which worked and i was worried i would break the phone. Then i found a clip with the packaging the phone came with and had to push it in really hard to get it to open. I can’t quite believe you have to go to so much effort just to get the sim card in. Can’t wait NOT to try to work the rest of it!! Good luck everyone! Thanks for the tip, the paperclip worked a treat on the third time of trying. I was afraid of damaging the phone the first two times I tried. I applied a little more pressure the third time and bingo! Thanks again. I was using the paperclip and was terrfied i was pressing to hard so on liek my 3rd or 4th try, i pressed harder and it finally popped out… thanks! I purchased and IPhone 4S todayand thried to insert the Afghanistan Etisalat SIM card but it is tick and doesnt fit into the tray of the IPhone. What should i do? please give me a suitable instruction in this regard. I had a difficult time opening with a paperclip, but try slightly tilted angles and press pretty solidly in. YOU MAY HAVE TO CATCH IT AT JUST THE precise angle and it pops open by itself. Strong bendable small wire worked for me. very tricky method 🙂 tfs,…. Apple I phone 5 . I wish to have a sim card for I phone 5 , I do not under stand why one should cut a normal sim card into a nano one. It may work or may not. Will it provide the required result for 3G also. Thanks very much! Of course it seems ironic that a phone which is valued at £400 plus needs the use f a paper clip! I have an i phone 4 and was given an I phone 5s. I want to take my SIM card out of my 4 at put into my 5 but don\’t want to loose any data. Can anyone help me w instructions?